There’s loads happening in all sorts of scenes across the world this weekend, from international CS:GO to Dota 2 in Sweden to top-tier StarCraft in Korea. There’s also one of the biggest-ever Rocket League prize pots on the line and a massive Street Fighter V tournament underway in Paris. GL HF! Another long-running Dota 2 league reaches its final stages, this time in Sweden. Top-tier teams including OG will be playing throughout the weekend. Matches begin at 10:00 BST/02:00 PDT on Saturday and at 11:00 BST/03:00 PDT on Sunday. The stakes aren’t quite as high as they were at Epicenter, but it’s bound to be great Dota nonetheless. You can find the stream here. More CS:GO, this time on the other side of the world. A similarly impressive lineup of teams including Astralis, NiP and Fnatic go head-to-head in the USA for a slice of a massive $1,750,000 prize pool. Games begin at 00:00 BST/16:00 PDT (the previous day) on both Saturday and Sunday. Find the livestream here. Four of the best SCII players in Korea (and therefore the world) fight to determine a final champion for the region. There’s $17,000 at stake for first place as well as 1,000 WCS points. Games begin at 10:00 BST/02:00 PDT on Sunday. Find more information, as well as the stream, on the official site. This massive qualifier for the Americas Spring Championship is open to all, but expect to see a lot of well-known faces too. The top 128 in the region will duke it out across the weekend, starting at 18:00 BST/10:00 PDT each day. It’ll be streamed on Twitch. One guy in last week’s comments asked, and we’ve delivered! 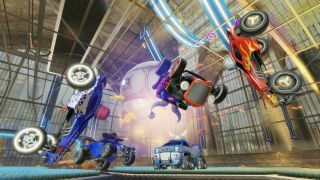 Rocket League’s inaugural esports, er, league has reached its first moneyed final, with the conclusion of qualifier 1 in Europe and North America playing out over the next few days. The $5000 pot might seem modest by modern standards, but this is early days for an exciting new esport. Find more information, and the livestream, on the official Rocket League esports site. France has produced some impressive Street Fighter V players of late, so it’s only appropriate that Paris is the next stop on the Capcom Pro Tour. Andi Hamilton looked forward to StunFest in his most recent column, and anticipates great things for the event. Play begins at 19:00 BST/11:00 PDT on Saturday and at 18:00 BST/10:00 PDT on Sunday. A word of warning: the initial livestream has been a bit flaky, particularly when it comes to SFV. Hopefully they’ll have sorted it out by the time the top 8 rolls around. In either case, you can find more info and the livestream here. Smite’s European and North American Spring Split enters week eight with another round of play this weekend. You’ll find matches starting at 18:00 BST/10:00 PDT on both Saturday and Sunday, with Europe leading the charge on Saturday followed by NA on Sunday. Schedule and livestream details can be found on the HiRezTV site.